I was involved in my first “business” when I was just 11, at primary school through an enterprise scheme my class mates elected me as their managing director and we ran an eco-fair selling all recyclable products. After this at the grand old age of 11, I took a little break from the business world until I was 17 when I started the first version of We Are The Future, again this was through another enterprise scheme run by Young Enterprise Scotland. We decided we wanted to do something totally unique from all the other companies participating in Young Enterprise Scotland so we decided to set up and run an entrepreneurship event. We ended up running an event for around 135 school students from across central Scotland and managed to attract the attention and support of Lord Sugar and Michelle Mone. I then moved to Edinburgh in 2012 to study International Business Management at Edinburgh Napier University and brought We Are The Future with me! However it wasn’t until February 2013 that I officially registered We Are The Future as a social enterprise. It was also around this time that I seized the opportunity to run The Start-Up Summit which was a huge success the previous year and I started to build a team and collaborate with organisations to run the summit. Q2. What exactly does We Are The Future offer, and how can people benefit from it? We Are The Future (WATF) is an organisation built by entrepreneurs for the advancement and enablement of future entrepreneurs. We do this through the medium of inspiring and engaging entrepreneurial events. We quite literally bring everything a start up business needs to succeed into one room! So far we have linked hundreds of entrepreneurs and business start-ups together with successful entrepreneurs and organisations through events such as The Scottish Start-Up Summit which took place on Wednesday 20th November 2013 at The Assembly Rooms in Edinburgh. Q3. We Are The Future is a not-for-profit social enterprise – why did you choose this model? I decided to make WATF a social enterprise because fundamentally we want to help people succeed, particularly young entrepreneurs! It made perfect sense to become a social enterprise because it merged with the aims and objectives that we are trying to achieve – Entrepreneurs helping other entrepreneurs! Q4. In addition to running We Are The Future, you’re also a full time student. What’s it like managing We Are The Future and how do you combine it with university? Difficult. I love being part of WATF and watching it grow, it’s the most fun I’ve ever had being involved and seeing where this can go, but juggling a fast growing company with university deadlines can be tough. Ultimately though being a student has been very beneficial for me, it has given me access to lots of very useful resources and people which I wouldn’t have otherwise. You need to learn to strike a balance between the two and so far I seem to be doing that pretty well – it’s something I am very conscious of though as WATF grows along with my coursework requirements! Q5. How difficult was it growing We Are The Future , getting clients, promoting it, etc? WATF has been very fortunate is promoting a mission that has been very easy for clients and organisations to buy into and our greatest advantage is that we actually deliver what we promise! You need to know your market though and you need to know what your attendees want to gain from the event, then be very clear with what they will gain from it – we are working with the entrepreneurs who all have a pretty demanding work load so we need to be crystal clear on what they will gain from attending one of our events. So far we seem to have got that right and that is what has allowed us to grow they way we have. Q6. You have your domain name www.wearethefuture.org.uk and your email hosting with Easyspace. Why did you decide to choose Easyspace? I chose Easyspace because I attended the Start-Up Summit 2012 which Easyspace was sponsoring and part of the sponsorship was to provide all the attendees with one year free web domain and email hosting. So I contacted Easyspace and signed up – these are the opportunities start-up businesses can really benefit from! Q7. Tell us about your site, and why you chose a .org.uk domain over a .co.uk or a .com. I chose .org.uk because we are a social enterprise and I wanted our website to reflect that and just felt .org.uk did that more than co.uk or .com. Q8. Do you do the web design and updating of your websites yourself? How easy do you find that? I originally designed the We Are The Future website myself using wix.com – a great way for a start-up to get a good looking website for relatively cheap, this also enabled me to edit and update it myself. For the Scottish Start-Up Summit event website, one of our sponsors Ignited Minds built and designed the website for us. 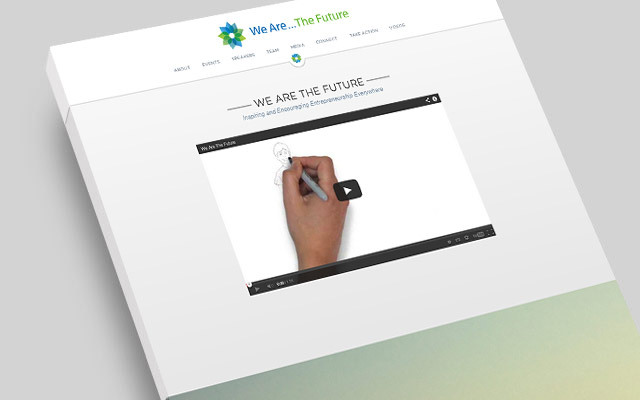 Fortunately as the business has developed I am now able to get a professional company to redesign the We Are The Future website, which I am looking forward to seeing soon! Q9. As part of Global Entrepreneurship Week, you recently organised the very successful Start Up Summit in Edinburgh. Tell us about this event and what was involved in putting it on. 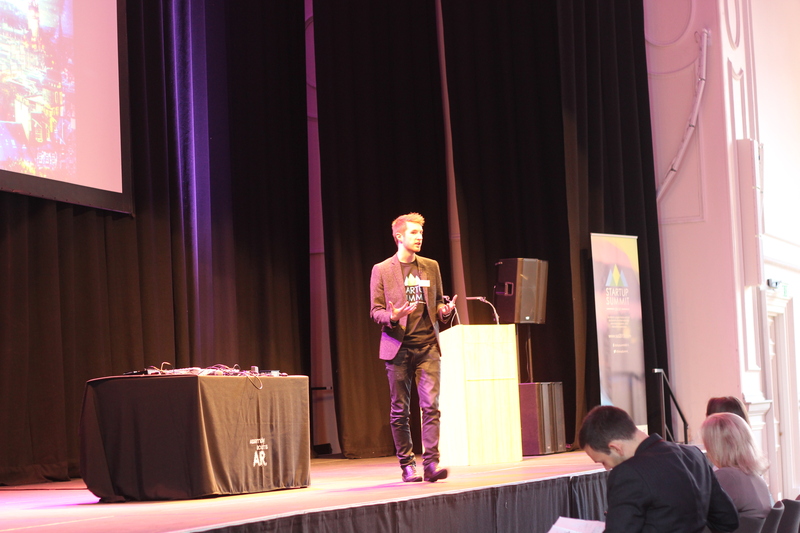 The Scottish Start-Up Summit was Scotland’s National Start-Up Summit and the largest in the UK during Global Entrepreneurship Week. 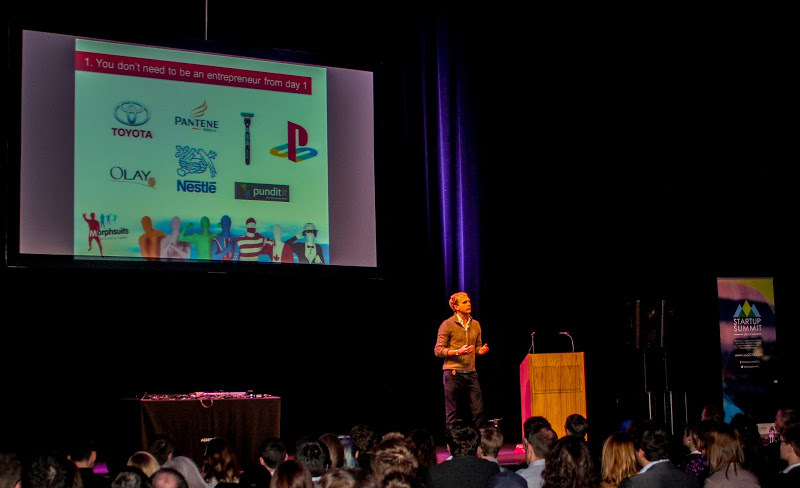 SUS13 was an event where experts share the secrets of success with young entrepreneurs. We had decades of internationally-renowned business experience, tens of millions of pounds in profit, in one room. 500 budding entrepreneurs, organisations and business leaders gathered in The Assembly Rooms in Edinburgh on 20th November and heard from Fergus Ewing – Scottish Government Minister for Enterprise, Energy and Tourism, Gregor Lawson – Founder of Morphsuits, Abigail Stevens – Founder of Think Global Recruitment, Russell Dalgleish – Partner of Exolta Capital Partners, Gavin Oattes – Owner of Tree of Knowledge, Fraser Doherty – Founder of Superjam and US Entrepreneur Stacey Ferreira – Founder of MySocialCloud. To organise an event like this was a lot of work, many, many months of planning and time! The trick is to have a good team and that is something I really benefited from, the Project Manager Jasmine Dittman was incredible at pulling together event management of the summit and I focused on raising the sponsorship, building the partnerships (we had over 30 across 3 countries) and sourcing the speakers. I also took on a lot of advice from Sam Zawadski who ran the summit last year and loads of other entrepreneurial leaders and experts. We has some incredible sponsors and partners and I think this was because we had created an event that brought genuine benefit to the entrepreneurs that were attending and we offered great value for our sponsors. I couldn’t be more pleased with the result of the summit, it was a resounding success and the feedback has been brilliant, one woman described it as the best event she has ever been to and Fraser Doherty the founder of Superjam said that events like The Scottish Start-Up Summit were crucial to helping towards his success when he started out. Q10. You managed to attract a lot of great speakers, including a number of high profile entrepreneurs to Start Up Summit. How did you get them to take part? Sourcing the right calibre of speakers was at the forefront of my mission to deliver a high quality event with a high impact for the delegates. I had a good idea of the people I wanted to speak fairly early on and I was very determined to invite them to speak at the summit. The secret to getting high profile successful entrepreneurs is a mixture of persistence, selling the mission of the event successfully and aiming very high. You need to contact the highest level of entrepreneurs, I was told that I would never get Fraser Doherty because he was too successful and too busy – turns out all I needed to do was ask and he said yes! I also exhausted a lot of my contacts to give me introductions to people and asked a lot of favours from people. The most consistent feedback I’ve heard since the summit was how great all the speakers were, which is really satisfying to here. Q11. You also use Facebook, Twitter, YouTube, etc, to promote your website & events? How successful has it been for you? Any advice on how businesses can use social media to promote themselves? We ran quite a big social media campaign to promote the website and particularly The Start-Up Summit, social media is such a power tool and if you don’t take advantage of it you will quite simply fall behind. A month before the event we spent £7 a day of Facebook ads, which is really cheap and very effective, it gets your message out to the people you want to target and is a great way to engage people. We also used Twitter and LinkedIn a lot as well, you need to be conversational and engaging with your followers or connections and the truth is you need to just put the message out on social media very day, sometimes 2, 3 times a day because if you don’t people forget to sign up, they need to see the message consistently for a few weeks before they actually buy a ticket or sign up. Q12. What mistakes have you made in your businesses, and what would you have done differently? When I was 18 I had just moved in Edinburgh, I was in my first year at university and I had started a training and events management company, I thought I would be able to set up a training event and make some good money pretty quickly – I was wrong. I was under prepared, inexperienced, naïve and lost loads of money, more money than an 18 year old that had just started university could afford to lose! Looking back now though, this was the best thing that as ever happened to me, it taught me what failure is which now makes me appreciated success a lot more. It also made me determined not to lose that kind of money again and work very hard to make sure I succeed in anything else I do. I like the freedom of working for myself and there is a lot more satisfaction when you succeed because you are ultimately responsible for that success. It’s great because you can chose the organisational culture, the people you want to work with and the style in which the company operates – you don’t have that some control when you work for someone else. I’m also impatient, so the idea of going in at the bottom and working my way to the top over a number of years just doesn’t appeal to me, I’d rather work for myself and be right at the top straight away. When you phone or email an organisation and you want to speak to their chief executive you are more likely to get that meeting or call if you are at the top of the organisation than you are if you are at the bottom working your way up. 9-5 just doesn’t work for me at the moment and I’m hoping I won’t ever be in that kind of job! Without sounding cliché, Richard Branson has been a very inspiring entrepreneurial leader for me because he is a great example someone who puts enjoyment and fun at the forefront of his organisation which is something I have tried to do with We Are The Future. He is also responsible for one of the world’s best known brands, which is something every entrepreneur hopes to be able to emulate. Q15. What advice would you give to somebody – particularly students – who are thinking of starting their own business? My advice, do it! Go start something now, it might not and probably won’t be successful the first time round, but that’s great experience! The idea that you need to wait until after university is just false, you should do it now while you are at university and have more stability – if you fail at your first business while you are university you have a massive safety net, so it’s a great time to do it. There are loads of great support agencies out there so get out and really utilise that support. There is also a lot of grants out there for start-ups so don’t risk your own money, use the money available to you. Scotland is great for advice and support, so contact entrepreneurs and business leaders and just ask for their advice and more often than not you will get some really useful help from them. Following the success of The Scottish Start-Up Summit we are going to track and monitor 5 start-up businesses that started up as a result of the summit to see how their business grows and progress over the next few years so we can assess the effectiveness of the event and if we are providing the right resources to the entrepreneurs attending. We are also taking the summit on tour across the UK and maybe even internationally, so far we have had 13 people contact from across the UK including, Glasgow, Aberdeen, St Andrews, Stirling, Edinburgh, London and Sheffield. These events could vary from start-up events to tech events to growth event or whatever that local area thinks they will most benefit from. We are also planning on finding some new offices in Edinburgh and growing the team to handle in the increased workload. Hopefully Bruce’s online activities has inspired you to become an entrepreneur. If it has, then begin by registering the domain name you want for your business. Then get your website set up. With this in mind, Easyspace has created EasySiteLive PRO – a website builder product, to help get your website up and running in no time. Click here to try our new EasySiteLive PRO website builder for 21 Days Free of charge.